“Office Christmas Party” star T.J. Miller hints that he won’t be dodging conversation about his recent run-in with the law while hosting Sunday night’s Critic’s Choice Awards. “Tonight I will address the elephant in the room at @CriticsChoice on A&E. Tune in and find out,” he tweeted just hours before he was set to go on stage. The aforementioned “elephant” is his arrest on Friday morning. According to TMZ, Miller attended the GQ Man of the Year party and afterwards he and an Uber driver had an altercation about Donald Trump. Tonight I will address the elephant in the room at @CriticsChoice on A&E. Tune in and find out. The driver claimed that the “Deadpool” actor slapped him. The driver didn’t have any visible injuries, the site reported. 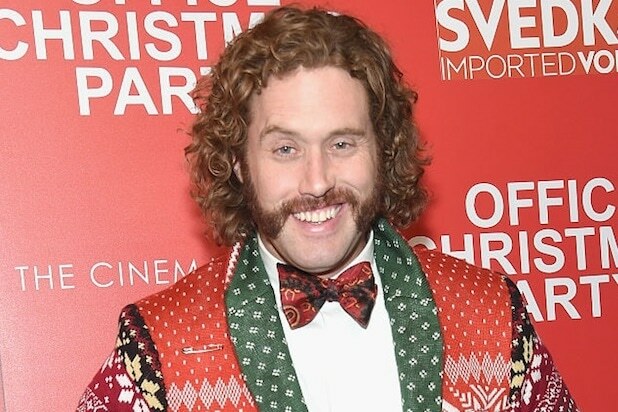 The actor, who last year won a Critics Choice award for his portrayal of Erlich Bachman on the HBO comedy “Silicon Valley,” can currently be seen in “Office Christmas Party,” which also stars Jennifer Aniston, Olivia Munn and Jason Bateman. The live awards show from Barker Hangar in Santa Monica, Calif. begins at 8 p.m. ET/5 p.m. PT.